Seurat Painting | Paint with the Pointillator! 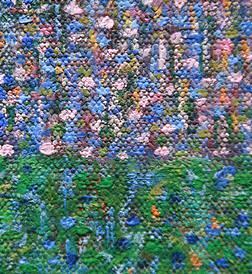 At left you see a closeup of Seurat's painting. It is a closeup of the the man laying down on the lower left. Even thought he appears to be wearing white pants, as you can see, the part of the pants in the shadow just above the grass has no white in it. It's only when you look at it from a distance that the colors blend in. 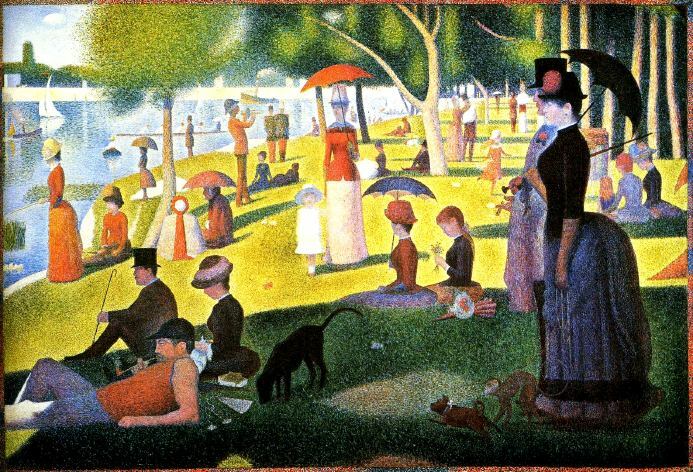 Seurat spent two years on this painting. He carefully planned it out with several sketches first. You can find this painting at the Art Institute of Chicago. Click a colored square in the left column to change the color of your paint. Click one of the dots at the bottom row to change the size of your dots. Click in the white area to place a dot. Not working? Install the latest Shockwave and then restart your browser. Still not working? Save this page to your hard drive. Make sure you select the "web page complete" option so you make sure the paint.dcr is in the same directory as this page. To buy a painted copy of the painting above, click on the painting.